One of my absolute favorite places to eat is Chipotle. Judge me, I don’t care. 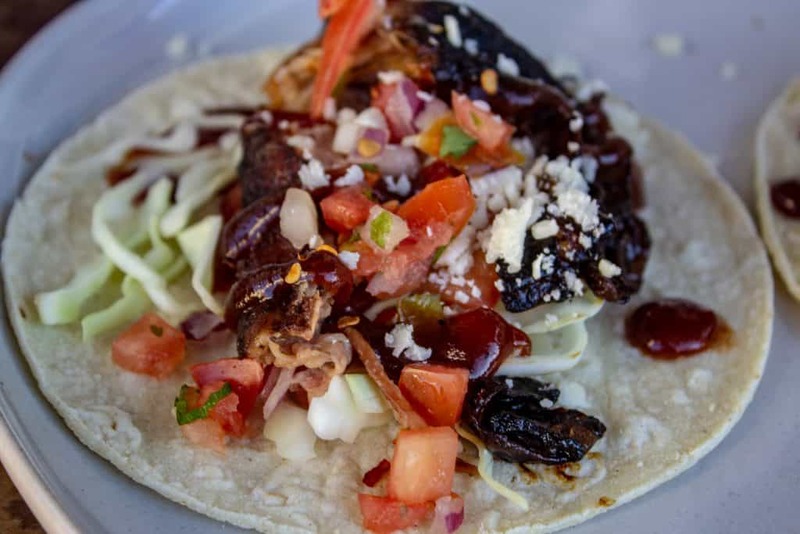 Despite their challenges with handling food safely, they still make some of the best tacos and burritos around. If I could, I’d eat there every day. But I can’t do that. Instead, I have to be “responsible”. Spending money on Chipotle every day could be considered frivolous spending that is totally unnecessary. I might disagree… but I’m married and it’s not all about me. That is also up for debate, at least until she reads this. Since I can’t eat at Chipotle every day, these smoked and shredded beef tacos are the next best thing. 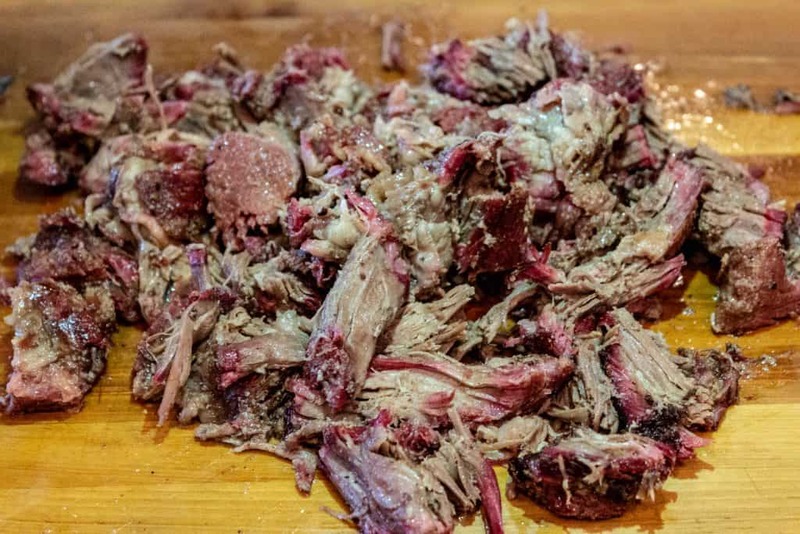 I’ve made plenty of pulled pork, and the principles of making pulled pork and shredded beef are similar. 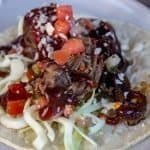 It all starts with a nicely marbled chuck roast and ends with corn tortillas loaded with shredded beef and all the fixuns heading straight for your mouth. Before we smoke the chuck roast, it’s important to get it well seasoned. In a small bowl combine garlic, salt, pepper, paprika, and cumin. 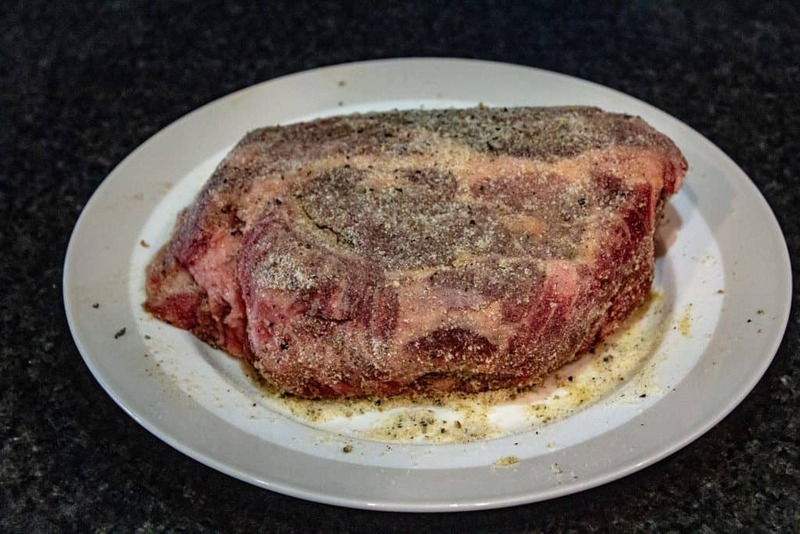 Rub the outside of your chuck roast with olive oil, and then generously apply the seasoning to the outside of the meat. 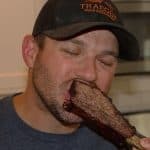 It’s really tough to over season this cut of meat! It will soak up a lot of the flavor from this dry rub during the cooking process. Your taste buds will thank you later! After you’ve seasoned the meat set up your smoker to cook at 225 degrees. This takes about 15 minutes on my Traeger, and that’s the perfect amount of time to let the meat soak up some of the dry rub before it starts taking on smoke. When the smoker has gotten up to temp put the chuck roast in, and let it cook until the internal temperature is 160 degrees. I used a 3-pound chuck roast for this recipe and it took about 4 hours to get up to temp. Use a good instant-read meat thermometer to check the temp. When it hits 160 pull it from the smoker and put in a small aluminum foil pan with a 1/2 cup of beef broth. Cover the pan tightly with foil and return the chuck roast to the smoker. Turn the heat up to 250 and let the chuck cook until the internal temperature is 205. This took an additional two hours for my three pound cut of meat. When it hits 205 pull the pan out of the smoker and place it in a high-quality cooler to rest. Let it rest for at least an hour. This will allow the juices to redistribute in the meat, and the muscle fibers will continue to weaken. After the meat has rested, pull it from your cooler and shred it. You can use two forks, but my preference is to use meat claws. Shred the meat, and then dig in. We ate the shredded beef on corn tortillas, but it’s excellent on flour tortillas too! In addition to the shredded beef, we added cheese, cabbage, pico, sour cream, and sweet and spicy barbecue sauce. 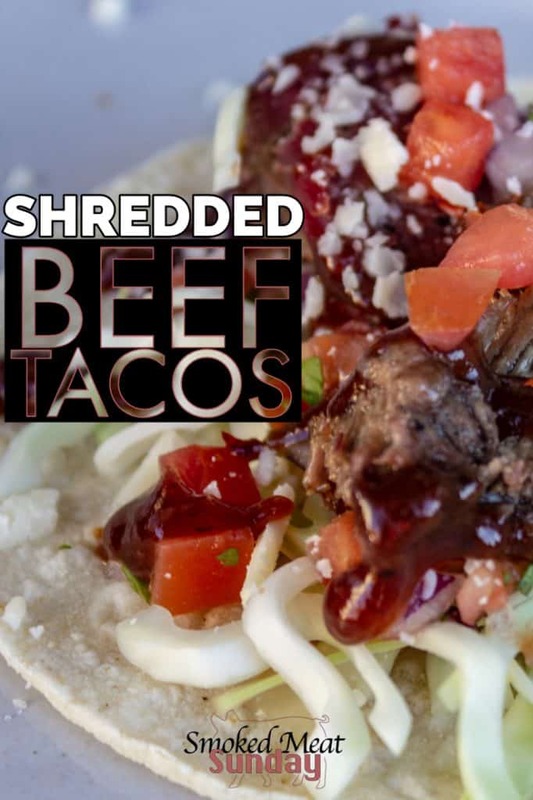 They were by far the best shredded beef tacos I’ve ever had… much better than Chipotle… and coming from me, that’s saying something! Don’t like tacos? This would be great on a shredded beef sandwich too! Pair this with a tangy mustard coleslaw and you’ll have a wonderful barbecue meal! I love Chipotle, but after trying these shredded beef tacos, I'll never buy beef tacos at Chipotle again. They were easy to make, and the layers of flavor were out of this world delicious! After applying the rub to the chuck roast get your smoker set up to cook at 225 degrees. 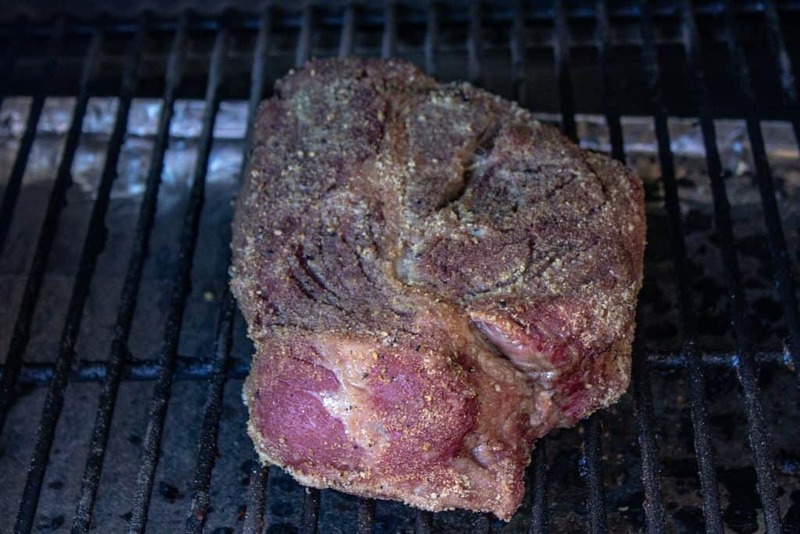 When the smoker gets up to temp place the chuck roast directly on the grill grates, and let it cook until the internal temperature is 170 degrees. 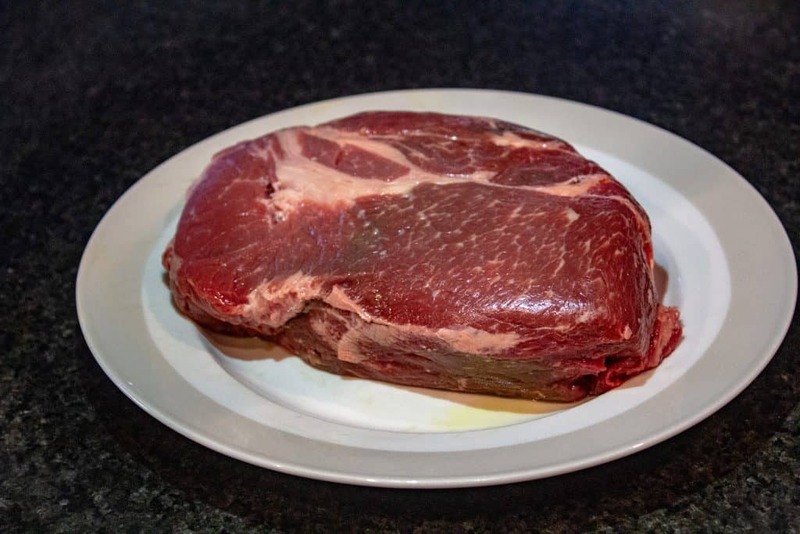 When the chuck roast's internal temp hits 170, remove from the smoker and place in a small disposable aluminum pan with a 1/2 cup of beef broth. Cover the pan tightly with aluminum foil. 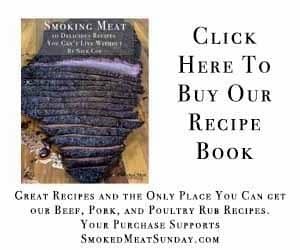 Increase the heat in your smoker to 250 degrees and place the pan with the chuck roast inside. Let the chuck roast continue to cook until the internal temp hits 205 degrees. At 205 degrees remove the pan with the chuck roast from the smoker and place it in a high quality cooler to rest for at least one hour. After an hour of resting remove the pan, shred the beef using meat claws.